In college I first started reading self-help books. Classic stuff like Think and Grow Rich by Napoleon Hill and How to Win Friends and Influence People by Dale Carnegie. It was also during this time that I became a little obsessed with success. I still focus a lot on how to live a successful life but my definition of that success has changed a lot. Books like those, that celebrate the charismatic salesman, have remained popular for a century in large part because of how Americans find extroversion to be so appealing. 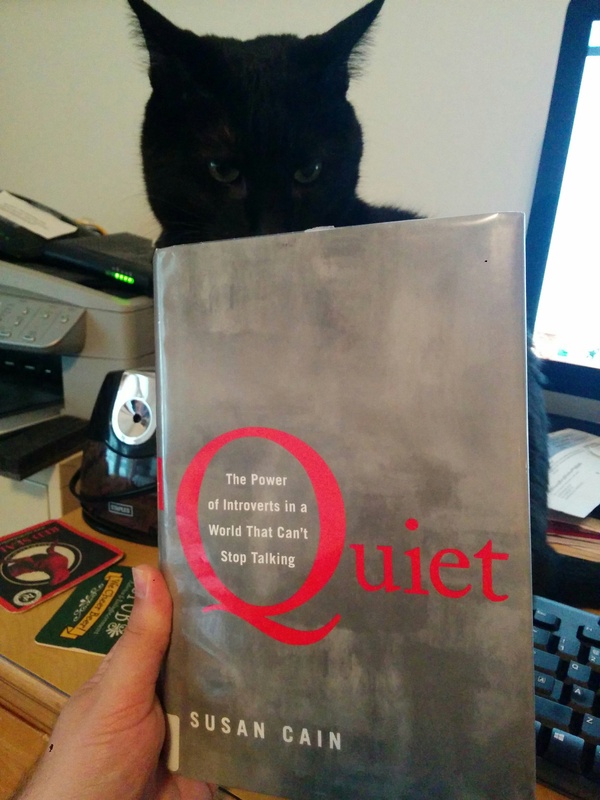 Quiet, in hardcover with avid reader cat, Bagheera. Susan Cain sets out to advocate for the other side of the spectrum. Successful and valuable doesn’t need to be equated with extroversion. Being calm, contemplative, and working by oneself can (and has) lead to incredibly important decisions and actions that change the world. And being true to that introversion doesn’t need to leave you shy, scared, or anxious either. The extrovert versus introvert concept is one that I’ve always struggled with because I tend to identify myself as introverted, but I’ve done well in extroverted activities. When I was active in children’s theater my nickname was “Centerstage” because of a stunt I pulled stealing the center spotlight from the star one occasion. But after any amount of socializing, I definitely find myself needing to recharge on my own. I can’t problem solve with a group chattering away; I need to think it through myself. You definitely can’t count on me being creative with anyone else watching – that’s me time and mine alone. I might share later if I feel like it. As we progress through the book, we start seeing some advice the introverts can take to the bank and not just the facts of introversion contrasted with extroversion. The result is that this book could be a self-help resources for the contemplative. Instead rushing our bodies with adrenaline to force away our quiet nature like typical motivational advice would suggest, we can use it to our advantage to better value ourselves. As we take full stock of our quiet times, we can find ourselves more effective in the situations that play more to extroversion. The company Christmas party is a lot more manageable when you have a good plan to have a strong interaction with one person instead of working the room. The sales call doesn’t have to be scary when you have hundreds of questions you’re prepared to honestly ask and discuss. My friend Paul refers to this book as “the introvert bible.” That’s about right. It’s a good offering that both praises and aids the introverted human. Between one-third and one-half of all people are introverts, so give it a read to better understand how you (or half of the people you meet) are experiencing the world around you.